www.TodaysDietitian.com | Trouble viewing this e-mail? Go here. If your client’s doctor suggests better blood glucose management, the Diabetes Buddy app may be right for them. Designed for iPhone, iPod touch, and iPad users, this app tracks users’ weight, the foods they consume, hydration levels, physical activity, glucose readings, and insulin injections on a daily basis. I hope all of you had a wonderful holiday season with friends and family, and that you’re looking forward to the joys and challenges of a new year. As you know, with the new year come New Year’s resolutions to lose weight and start exercising. Many of my friends no longer make this promise to themselves because they always break it within the first six months of the year. And I must admit, I’m just as guilty. This month’s E-News Exclusive shares some good news concerning this popular resolution. Toby Smithson, RD, LDN, CDE, discusses a clever strategy dietitians can share with clients that will enable them to lose weight gradually throughout the year by making small, simple changes to their eating and exercise habits. Sounds too good to be true, but this weight-loss method proves a little does go a long way. After reading the article, make sure you visit Today’s Dietitian’s website at www.TodaysDietitian.com. You’ll find the digital issue of the magazine plus the latest news and information that’s relevant and reliable to daily practice. We welcome your feedback at TDeditor@gvpub.com. Enjoy the e-newsletter, and follow Today’s Dietitian on Facebook and Twitter. Welcome to the start of a new year. What’s on the minds of many—if not most—of your clients and patients is the No. 1 New Year’s resolution: lose weight. And many RDs are trying to figure out ways to help them achieve this goal. During the holiday season, individuals gain an average of 1.7 lbs, according to a recent study from Texas Tech University. Some gain even more and believe they have to go on a crash diet and begin a vigorous exercise program to shed the pounds. But what many clients don’t realize is that all they need to do is make some small changes to their daily eating and exercise habits and the weight will come off throughout the year—slowly but surely. Achieving a healthier weight reduces the risk of type 2 diabetes and cardiovascular disease and its associated risk factors (eg, hypertension, high cholesterol), improves mobility, facilitates sleep, and enhances quality of life. Keri Gans, RD, and author of The Small Change Diet, encourages her patients at the start of a new year to aim for small, achievable goals. “A long to-do list only gets overwhelming for them, and it sets them up for failure,” she says. We’d like to extend our appreciation to everyone who has liked our Facebook page and helped us reach 10,000 fans! We’ve identified our lucky 10,000th fan as Melissa Joy Dobbins, MS, RD, LDN, CDE, of Wilmette, IL, who will receive a free one-year subscription to Today’s Dietitian to commemorate this milestone. Melissa is the founder of Sound Bites, Inc., where she promotes sound science, smart nutrition, and good food. She is a communications coach for dietitians and also interviews dietitians on her blog at www.soundbitesrd.com/blog/. Congratulations, Melissa! @tobyamidor, and we may feature your query! Congratulate the newest additions to the dietetic field with products designed specifically for the on-the-go nutrition professional. From messenger bags and tote bags to apparel and journals, the Today's Dietitian gift shop has the perfect gift for recent grads or the RD to be. Check out our secure online shop today or call toll-free 877-809-1659 for easy and fast ordering. Have a product or service you want to market to dietitians and nutrition professionals or an open position that you need to fill quickly? Today’s Dietitian offers many flexible advertising programs designed to maximize your results. From print advertising to e-newsletter sponsorships, website advertising to direct mail opportunities, Today’s Dietitian helps achieve your goals. E-mail our experienced account executives today for more information or call 800-278-4400! AlliedHealthCareers.com is the premier online resource to recruit nutrition professionals. Post your open positions, view résumés and showcase your facility's offerings all at AlliedHealthCareers.com! Today's Dietitian is mobile for iPhone, iPad, and Android users! Visit www.TodaysDietitian.com/digital on your phone's browser to view the mobile version of this issue and bookmark us for future issues. Learn about autism spectrum disorder in this month’s issue of Today’s Dietitian. Read the CPE Monthly article, take the 10-question online test at CE.TodaysDietitian.com, and earn two CPEUs! Continuing Education Special - FREE CE Course! 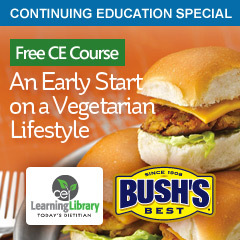 This special digital supplement includes recipes from Bush's Best and a free CE course on nutritional recommendations for vegetarian children. An article at CNN.com highlights the trials some children face when their peers try to bully them because of their food allergy. This New York Times article sets straight some issues that frequently bother those who are health conscious. Being mildly vitamin B12 deficient could be an indication that some older adults are at a greater risk of accelerated cognitive decline, suggests an observational study from researchers at the Jean Mayer USDA Human Nutrition Research Center on Aging (HNRCA) at Tufts University. Martha Savaria Morris, PhD, an epidemiologist in the Nutrition Epidemiology Program at the HNRCA, and colleagues examined data from 549 men and women enrolled in a cohort of the Framingham Heart Study, focusing on scores on the Mini-Mental State Examination (MMSE), a short list of questions and tasks commonly used to screen for dementia. The subjects were divided into five groups based on their vitamin B12 blood levels. Being in the two lowest groups was associated with significantly accelerated cognitive decline based on an analysis of test scores from five MMSE tests given over a period of eight years. The average age at baseline was 75.